Most of you will now know that Rex Hudson died on July 22nd in The Gloucester Royal Hospital, shortly following a severe stroke. 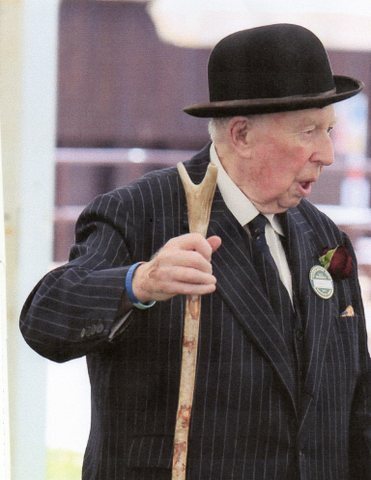 He was a remarkable man and for many years was the backbone of the Masters of Basset Hounds Association (MBHA). He was a land agent by profession and had his own business, some of his clients remaining with him until the day he died. He first experienced hunting with the English Basset in 1955 when he had a day with the Westerby during the time he was working in Nuneaton. In 1958 he established the Herefordshire Bassets with drafts from the Westerby and was, in September of that year, present at the meeting in Market Harborough when the MBHA was revived, after being suspended during the Second World War. Later, in 1969, he was appointed Secretary of the Association after the retirement of Mrs. Jo Groom. In those days the secretary of the MBHA virtually ran the whole Association, including the Stud Book and the job of Treasurer. Rex worked diligently in this office until 1994, when he handed the job of Secretary over to Don Peacock. Shortly afterwards he was appointed President of the Association in recognition for his long service and deep knowledge of the hunting Basset and the people involved. He remained President until 2003, when he handed the role over to Charles Bevin. Rex became a personal friend many years ago and often came to stay with us during the summer. Always a very considerate guest, he was a delight at a dinner party and had a bottomless fund of stories with which he entertained the assembled company long into the evening. He had a wide range of interests, which covered all types of hunting and country life in all its aspects - not just Bassets. His last public appearance, when he caught up with many old friends, was at the MBHA Annual Show Peterborough on July 16th to which he drove himself – both there and home again. Rex was one of the “old school” and will be sadly missed by many people throughout the hunting world and beyond.